From an honest mistake that we have made back in February, we have stumbled upon yet another master of epic Fumetti horror art, Emanuele Taglietti. This Undead Monday, we make amends by taking a look at some of the genuine masterpieces from the master of Fumetti horror art. 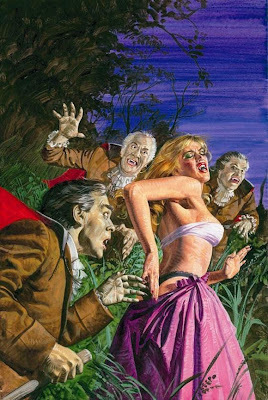 For the uninformed, Fumetti is an Italian word that literally meant "little puffs of smoke" (in direct reference to speech balloons in comic strips) and is now commonly known as the genre of Italian pulp horror comics with somewhat sleazy yet retrospectively epic art on the cover. Back in February, we stumbled upon some of the most provocative and alluring art of the genre by notable Fumetti artist Alessandro Biffignandi at Juxtapoz that were in turn sourced from Morbid Dementia. In our undead delight, we went ahead with an article highlighting some of the art featured on the webpage. To our horror (pardon the pun), this was a genuine case of mistaken identity that originated from Morbid Dementia and they have actually took down the original page while taking the opportunity to make amends by posting another article highlighting the works of the actual artist that conjured these delightful masterpieces, Emanuele Taglietti. Like in the case of Morbid Dementia, we were contacted by Taglietti, who pointed out our effort by directing us to his Facebook page. Which in itself is a genuine source of incredible art. We extend our most sincere apology to Mr. Emanuele Taglietti and would like to thank him for his graciousness. In addition, we would like to make amends by paying an official tribute to the master Fumetti artist here with another look at his work. However, may I remind you that like most other Fumetti work, some of the very best Taglietti pieces are unapologetically NSFW. So I would sincerely implored those intrigued by the master's work to head over to his Facebook page for a delicate dose of Fumetti greatness. We will be featuring more of Biffignandi's Fumetti works in a later entry. For now, hit the jump to check out some of the best pieces that are relatively SFW. Here's an interview with Emanuele Taglietti you may like. Emanuele's book is finally out. Can't wait to lay my hands on a copy.